Since its inception in 2010, the China Media Bulletin has informed tens of thousands of readers in over 40 countries—including journalists, policymakers, scholars, business executives, and interested citizens. 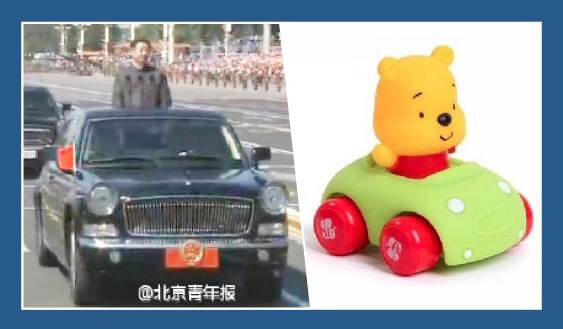 This image of Winnie the Pooh in a toy car—a spoof on photos of President Xi Jinping inspecting troops during a military parade—emerged as the most censored post of 2015 on the Chinese microblogging platform Sina Weibo. It was shared over 65,000 times within just 70 minutes before being deleted by censors. Credit: Weiboscope /The Nanfang. Subscribe here to receive the bulletin in your inbox each month and better understand what is happening in one of the world’s most important, complex, and fascinating media environments. In this issue: China's expanding surveillance state, latest crackdown on news and humor apps, behind-the-scenes of televised confessions, and a Hong Kong press freedom survey. In this issue: How various actors around the world are resisting Beijing's influence, censorship surrounding the New Year Gala and #MeToo in China, and the latest tech updates.